In presence of a large gathering, the memorial to commemorate the names of the 19 men of Airlie Parish who fell in the Great War was unveiled on Saturday at Craigton. 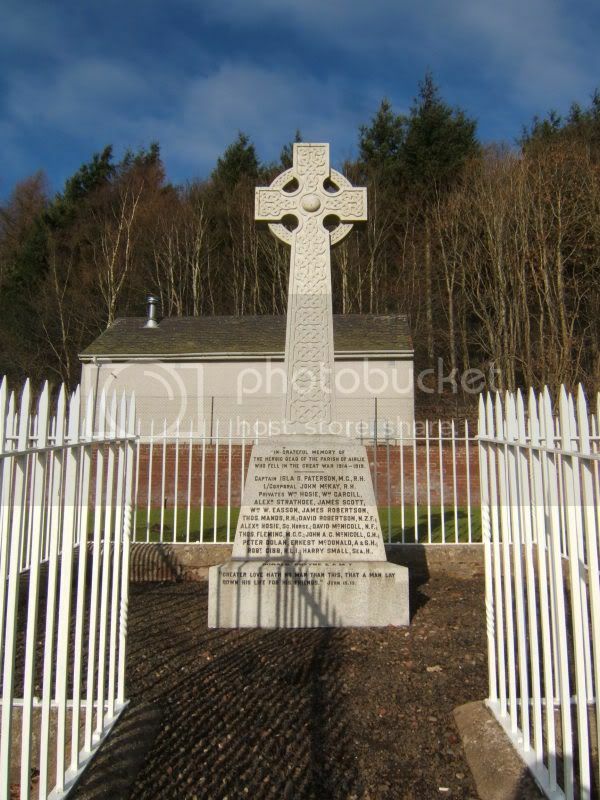 In the form of a Celtic cross, of Kemnay granite, 10 feet high, the memorial is built on a solid rock base, and is encircled by a border of concrete, on which will be erected an iron railing. It is the work of Sir James Taggart, Aberdeen. 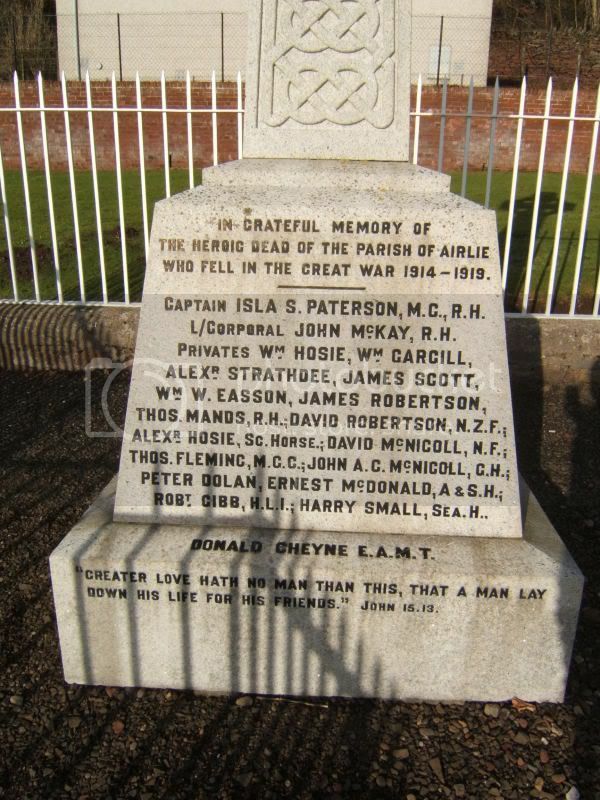 CAPTAIN ISLA S. PATERSON, M.C., R.H.; LANCE-CPL. JOHN MACKAY, R.H.; PTES. WILLIAM HOSIE, R.H.; WILLIAM CARGILL, R.H.; ALEX. STRATHDEE, R.H.; JAMES SCOTT, R.H.; WM. W. EASSON, R.H.; JAMES ROBERTSON, R.H.; THOS. MAUD, R.H.; DAVID ROBERTSON, N.Z. FORCES; ALEX. HOSIE, SCOTTISH HORSE, DAVID M’NICOLL, NORTHUMBERLAND FUSILIERS; THOMAS FLEMING, M.G.C. ; JOHN A. C. M’NICOLL, G.H. ; PETER DOLAND, A. AND S. H.; ERNEST M’DONALD, R.H.; ROBERT GIBB, H.L.I. ; PIPER HARRY SMALL, SEAFORTH HIGHLANDERS; DONALD CHEYNE, E.A.M.T. The proceedings opened with a procession of the children of the parish from Carlingwell, headed by two pipers. Rev. J. F. Linn, U.F. Manse, Chairman of the Memorial Committee, presided, and was assisted in the service by rev. W. Wilson, parish minister. In performing the unveiling ceremony, Miss Munro, Lindertis, said she was proud and thankful to unveil a monument to the glorious dead. That beautiful cross would stand for all time to remind generations to come of these gallant men, and of the principles for which they fought and died – for right over might and for the liberty of the whole world. After reading the names of the fallen, Rev. Mr Linn said they were not to regard the memorial as a tombstone. It was there to call these men to remembrance, and to recall to memory their earnest and devoted service for righteousness. They must all be thankful for the victory that was won. Let them exercise a spirit of gratitude, and let them seek to remember those who were maimed and wounded in battle, and remained with them. On behalf of the parishioners Sir Torquil Munro, Lindertis, thanked the memorial Committee for their successful work, and Mrs Cox, Cardean, expressed the company’s thanks to Miss Munro for unveiling the monument. After the singing of the National Anthem, the ‘Flowers of the Forest’ was played by Pipers J. Cuthill and David Cuthill, and the ‘Last Post’ was sounded by Corpl. Kenneth Cole. 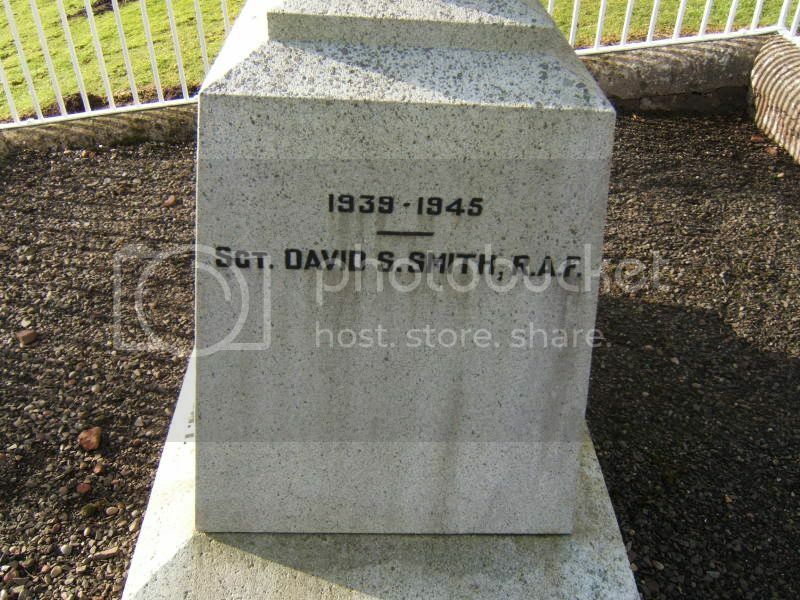 Sergeant David S. Smith R.A.F. Additional information: Son of David Steele Smith and Elizabeth Longmuir Smith, of Kingoldrum, Angus. Grave/Memorial Reference: Joint grave 8. C. 8-9. Grave Reference VI. G. 20. Son of Mr. and Mrs. Alexander Scott, of Cookston Farm, Airlie, Forfarshire; husband of Mary Low Scott, of Meikleour, Perthshire. James Scott was my granny's cousin. Son of Thomas Cheyne, of Lenrick Lodge, Forfar, Scotland. Served in the Sudan Campaign (1898), the South African Campaign and Natal Rebellion. Of all the CWGC cemeteries I have seen this one looks very "sad"
John Alexander Chalmers McNicoll	Pte	S/42383	7th	Gordon Highlanders	b Rattray,Perthshire	27/09/1899	e Blairgowrie	Age 20	Killed in Action	F&F	24/07/1918	Son of James McNicoll & Annie Dargie Cargill. La Neuville-Aux-Larris Military Cemetery	Fr 1695 Row A Grave 08. I found the date given as 20th.